Evidence has most important role in administration of justice. Basically we can say that evidence is the foundation of justice, no justice can be provided unless the judiciary knows the facts of the case, and obviously for knowing the facts of the case evidence has to be produced before the honorable court. The evidence are produced by the parties so that they can prove their point andd thereby convince the court that they are rightful to get the decision in their favor. Ramjas Versus Surendranath (AIR 1980 Allahabad 385) - The Allahabad High Court has said that the Evidence Law provides a way to the courts. It propounds (law dict meaning: offers for consideration) such rules which can comfortably conduct administration of justice. 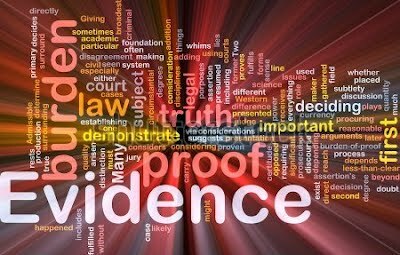 The word evidence has originated from a latin word 'Evidece' which means to prove any fact by legal resources. 1. All statements which the court permits or requires to be made before it by Witnesses, in relation to matters of fact under inquiry, such statements are called Oral Evidences. 2. All documents produced for the inspection of the court, such documents are called Documentry Evidences. Question. Can the affidavits be considered as evidence ? Answer. Although the affidavits cannot be considered to be evidence, but it may become if the court requires it to be so. The Allahabad High Court did not help the newspaper to be any Evidence. In all it can be said that the evidence law is such procedural law which also explains how the fact can be proved. Thus we can say that evidence law is one of the most important law without which the judicial system just cannot work. As our G8 Lawyers would look into this topic, more in depth analysis would come out and will be published here.